Product #555 | SKU Z-MFSB | 0.0 (no ratings yet) Thanks for your rating! The Z-Finder 8.1 cm Mount Frame for Small DSLR Cameras from Zacuto is a frame for DSLR camera bodies with 8.1 cm LCD screens, when also using a battery grip. The 8.1 cm Z-Finder aircraft aluminium frame must be used in conjunction with the DSLR Gorilla Plate - which is sold separately, and included with all Pro Z-finders. The frame attaches to the Gorilla Plate with two included thumb screws and then the Gorilla plate is attached to the bottom of your camera. The frame has a rubber coating on the back which stays against the LCD screen with pressure, without damaging the camera body or leaving any residue. The other side of the frame provides a snap-on connection between it and the Z-Finder. The Z-Finder snaps into the frame and can quickly snap off for going between video and photos. To release the frame from your camera, you can un-do the thumb screws and slide the frame off. This frame can also attach to a Zacuto DSLR Baseplate. This frame is designed for use with DSLR cameras such as the Canon 5D Mark III and Nikon D800 with an attached battery grip. 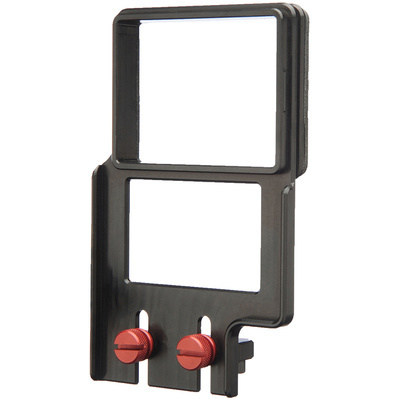 This frame attaches directly to a Zacuto Gorilla Plate (sold separately), which attaches to the camera body. This is done by tightening the two included thumb screws. The rubber backing protects the camera body without any residue or permanent hardware. The Z-Finder quickly and easily snaps onto your camera thanks to this 8.1 cm mounting frame.